One of my favorite types of Disney shorts is the combination of Mickey, Donald and Goofy in a jam. Their interplay is great, but usually, the best gags that Goofy and Donald have come in these shorts. Moving Day is one of them, and it’s a fun, silly little short that is quite entertaining. 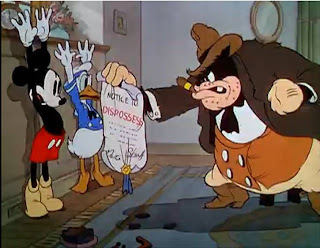 The premise is that Mickey, Donald and Goofy’s house is being “dispossessed” as the notice from Pete tells them. That means the three of them need to vacate the house as quickly as possible, to avoid Pete taking all of their things. That leads to all four trying to pack their truck and leave ASAP. As you can imagine, Donald doing anything in a hurry is comedy gold. Goofy is my favorite of these three characters, because I want to go through life the way he does. Nothing seems to get him upset, even as things continually go against him. In this short, it’s the piano that vexes him. Goofy tries to load the piano on his truck, but the piano keeps sneaking back into the house. The work done to make the piano have emotions and personality is some top quality animation. However, I’m afraid I’m much more like Donald, who lets everything drive him nuts. Moving Day features a fantastic gag, as Donald keeps getting stuck on things as he tries to hurry through the house and get things packed. 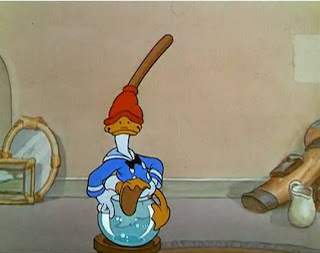 First, it’s a plunger that sticks on his tail, then a fishbowl on his tail and the plunger on his head. The shot of Donald looking into the camera with both items stuck on him is a classic. Mickey again doesn’t play into the short very much. He is there in the beginning, pacing the floor, and is seen packing one suitcase, but after that, the focus shifts almost entirely to Goofy and Donald. They are clearly the more entertaining pair by this point, and the gags in this short prove that. There is some lost opportunity, here, though, for Mickey to mix in with them. Since the short takes place in one confined area, it would make sense to have Mickey and Goofy deal with the same problem, for example. It makes logistical sense, but it might not make comedic sense. 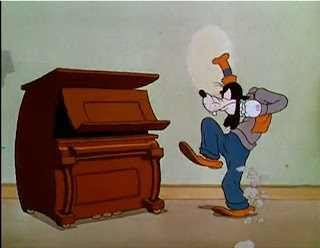 Goofy’s approach is to stoop to the piano’s level, but that may not be Mickey’s approach. Regardless, I think there could have been other ways to involve Mickey here. This is a great short, though. Donald and Goofy’s gags are well done, with Goofy’s taking a longer, slower period of time and Donald’s coming more rapid fire. This fits their personalities, though, so it makes sense. When Pete lights a match (after the gas has been leaking due to Donald) and blows the place up, you smile as all of the trio’s possessions fall onto the truck, ending with Donald getting stuck on the plunger again. This is a short that makes you smile, and that’s a great Disney feeling. All images copyright Disney. All rights reserved. What "dispossessed" means here is that Mickey and friends are so behind on their rent that they are being kicked out of the house and all their possessions are being seized to be sold off to pay what they owe the landlord. 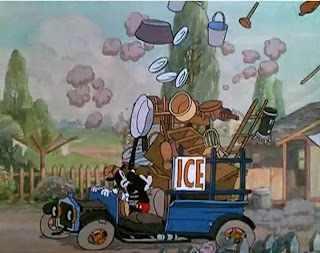 Once the moving gags begin, Mickey is only in this cartoon for about ten seconds. They could have done so much better than that—even closing the damn trunk could have become a series of gags that built. Instead, Goofy's (admittedly funny) sequence is stretched out too long. The treatment of Mickey as a dull character is so strange—it's as if the studio didn't even realize what they were doing. This cartoon has an exciting opening, a great pay off at the end and the gags in the middle are funny. However, I do feel it's the middle that lets the short down. Not only is Mickey all but ignored, but during Donald and Goofy's set pieces, Pete is forgotten about too. A lot of nervous excitement could have really added to the humour in this cartoon as the trio desperately attempt to sneak their stuff out the back, as quietly as they can, while Pete is only out the front door. 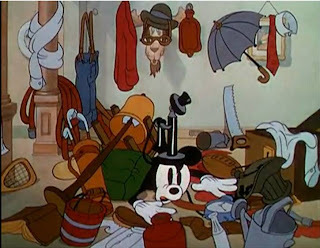 It would have been cool if Mickey was so desperate to move everything out, he just frantically packed everything in sight without thinking what he was doing. He could have pulled the nails out the floor and started packing the boards beneath him until had nothing to stand on. This hole could then have been a set up for everyone to fall into. Goofy and Donald could have messed up Mickey's packing with the piano plowing through it and Don knocking stuff over as he struggles to get unstuck. There were lots of ways the different activities of each character could have overlapped and, combined with the desperatation of the situation, made for an even more excellent cartoon. Still, one nice touch I spotted is the gold fish. After jumping from her bowl to avoid Donald she disappears from view and I wondered what happened to her. During the final scene the fish is one of the things to go flying through the air. Guess she died! Disney movies gives me a lot of wonderful memories. I often cosplay as characters in disney movies, I love cosplay costumes in those movies very much!